Editor's Note: Students at Roosevelt SHS -- whose student body is approximately 70% African-American and 30% Latino -- are forced to enter through the back door of their school. 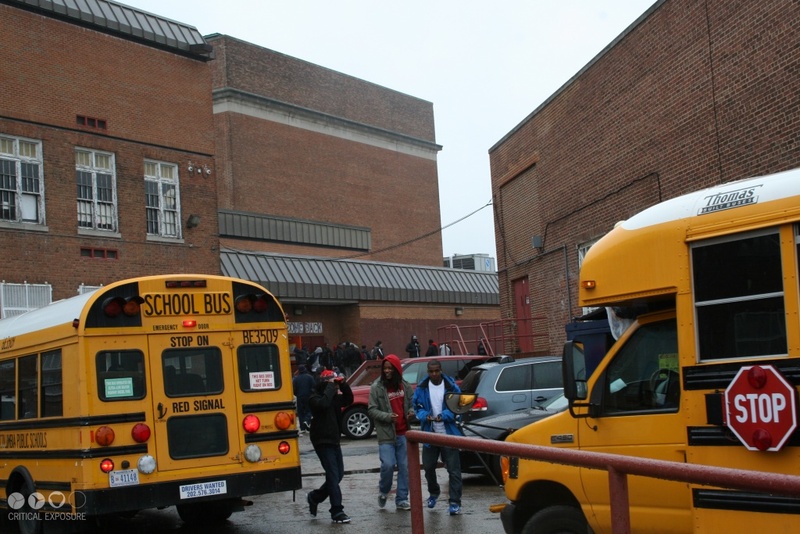 Editor's Note: Students at Roosevelt SHS enter and exit their school from the back door, which is connected to the street by a narrow roadway. Students have to dodge cars and buses on their way out; there is no sidewalk. 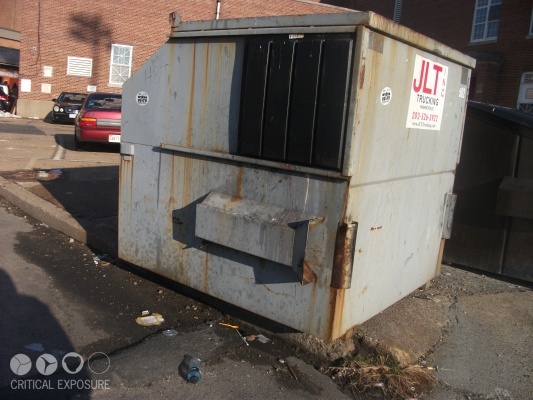 Editor's Note: Students at Roosevelt SHS are forced to walk past dumpsters before entering through the back door of their school. Editor's Note: The front door of Roosevelt SHS has been closed for decades and suffers from neglect. Students are forced to use the undignified back entrance instead, dodging cars, trucks, and dumpsters on their way to class. This is a student demonstrating a math problem on the board. She has limited space on the whiteboard so she has to be cautious of how much she writes. She has to erase, which can make things confusing. You can see the teacher would prefer to write on the whiteboard too, since there's not much on the blackboard. We need more new whiteboards and markers. In this science class, the water from outside of the building comes through and damages the paint on the walls. That's dangerous because, as you can see, there are electronics up there. Water damage also creates mold. This makes you feel unsafe in the classroom; some students are scared to sit underneath that spot in the class. Especially when there's limited space -- the class is big, and there aren't any empty seats. One time we had to go to the library because the ceiling was leaking from the rain. This is a tower on top of our school that is non-accessible. In this school the windows are broken and when it rains the schools classrooms get wet. 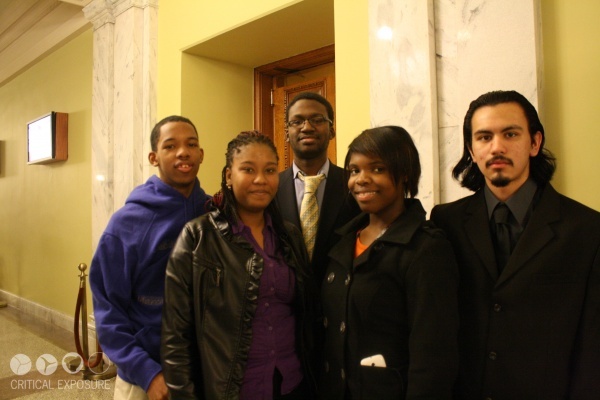 Editor's Note: Students from Roosevelt Senior High School attended the D.C. Council Committee of the Whole oversight hearing on public education. Referencing Brown v. Board of Education, Jacquan (center) and Michael (far right) argued passionately on behalf of Roosevelt students, teachers, and staff. They demanded that the city complete necessary repairs on the school's front entrance so that students may stop using the dangerous and undignified rear entrance. Citing capital budget statistics on school modernization, they also noted that the city has spent significantly less on Ward 4 schools in comparison to every other ward in the city. Michael ended his testimony with a clear and concise demand: Modernize Roosevelt now. Editor's Note: Sabrina, a 9th grade student at Roosevelt Senior High School, speaks out about the condition of her school building at this town-hall meeting for Ward 4 high schools. 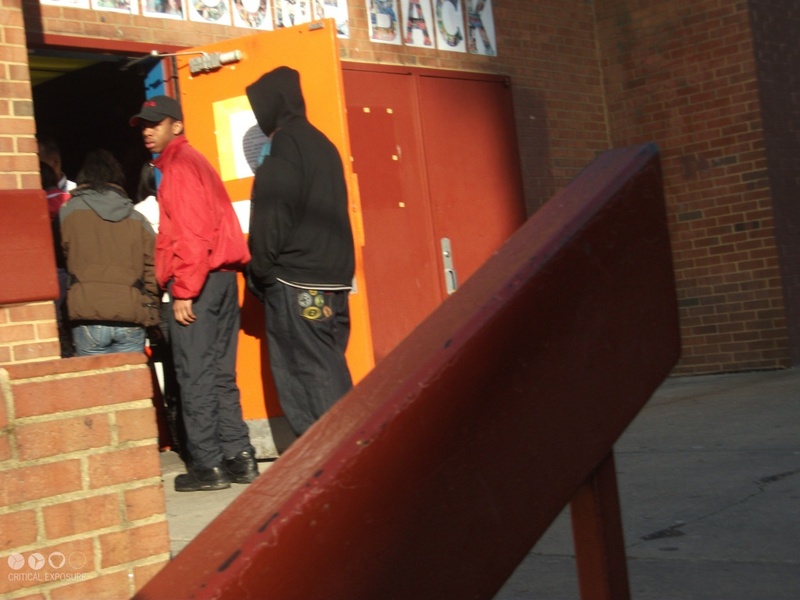 Sabrina and her fellow students demanded that DCPS and the D.C. Department of General Services begin the long-delayed modernization of Roosevelt, beginning with opening the front door of the school. Members of the panel included Ward 4 City Councilmember Muriel Bowser, Deputy Mayor of Education De'Shawn Wright, DCPS Chief Operating Officer Anthony deGuzman, and Department of General Services Director Brian Hanlon. While Sabrina spoke, her peers handed out photo-postcards to both the public officials and to the audience, depicting the decrepit state of the bathrooms, windows, and entrances at Roosevelt. Members of the audience wrote additional comments on the cards, which were later distributed at a D.C. Council hearing on education. The AP Cohort afterschool program is mostly 11th graders preparing for advanced classes and college. This specific group of students is being prepared for AP Literature, which they will take in their 12th grade year. Here they are being exposed to the different authors of excellent books and how to interpret a story on an advanced level. Mr. Wiltshire is the best teacher suited for this specific class because he sees the potential in students and challenges them. To me being challenged is important because there is always room to improve and programs like these help you locate your weaknesses. The AP Cohort Program is not like a regular class, I say this because while you are being challenged you are also having fun. Students get excited about their daily sessions because they are actually interested in learning new materials everyday. The materials that are being taught are used in some colleges. My personal experience in this program has been wonderful. I wish they had introduced this program even earlier in the school year. The AP Cohort program not only prepares you for your future education -- it can also help with the classes you are currently taking. Editor's Note: Anthony took these photographs to compare the newly modernized Wilson SHS with his school, Roosevelt, which badly needs repairs. 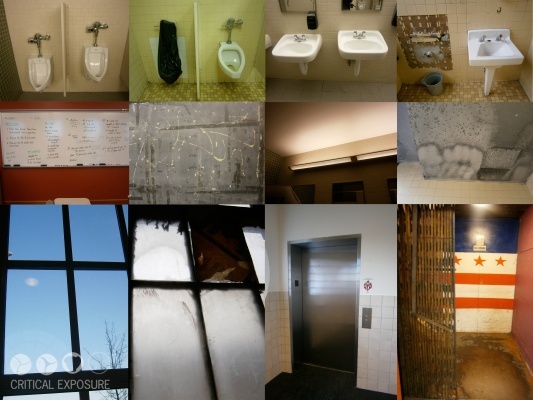 His photographs juxtapose men's bathrooms (photos 1-4); new whiteboards and old blackboards (photos 5-6); ceilings (photos 7-8); windows (photos 9-10); and one of Wilson's many elevators with Roosevelt's ancient freight elevator, which Anthony had to use for several months this year while he was on crutches with a torn ACL (photos 11-12). Caption by Sabrina, 9th Grade. These are the windows outside of my school. The paint is coming off because the school hasn't been painted in many, many years. It makes me feel as if no one is ever going to fix the windows and we deserve better. Caption by Alexandria, 12th Grade. 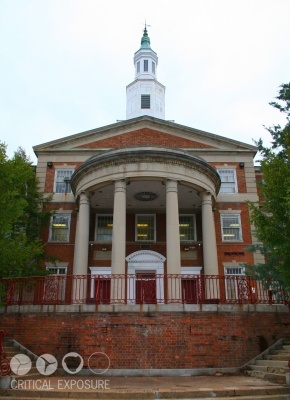 I think if we get a better school building, Petworth would be well-rounded. We have a new library, new sports field, nice convenient stores, friendly people, a post office, a subway station -- a lot of nice stuff going on and coming up. 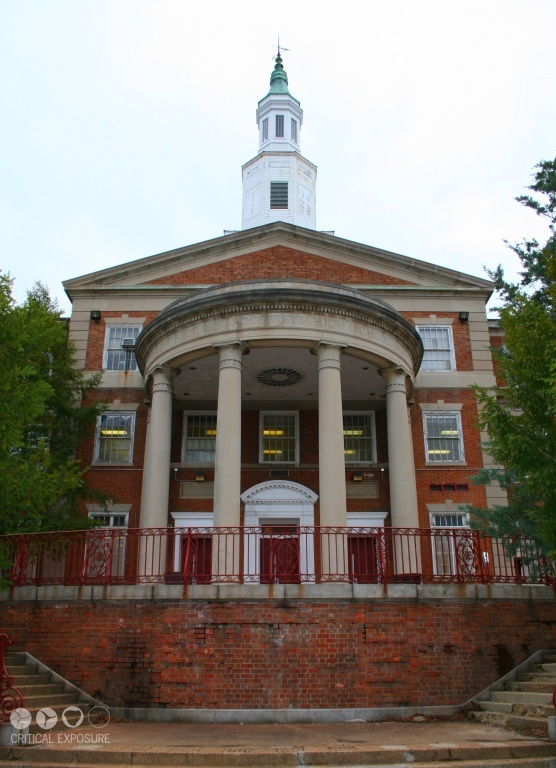 If you have a nice high school here, Petworth would be the place to be. Everybody would want to come and live in Petworth, simply because they know if they send their child to Roosevelt they will come to greatness, go to better colleges or higher education, and alumni would want to send their kids to Roosevelt. It'd just be a cycle -- new people would come and old people would come back. From the front of the school, it looks like the students who used to go to Roosevelt would have a sense of pride. Students now, we should feel the same way about entering our front door. But we don’t. Now we don't even enter the front door. If we did, it would make us feel better about our school. Students don't even see this [entrance], so you don't get the confidence. Looking at it, it's all rusted and stuff. When we talk to alumni or people from the city, they say, 'You go to Roosevelt? That's cool,' but it means different things to us, because our facilities are bringing us down. Looking at it, you can only imagine how great it used to be. Your environment affects you. We are at school more than we are at home. It's like where you live -- if our houses are in good condition, why can't our school be in decent condition? I think more people would want to come here if it was a better facility. Just because we don't have good facilities doesn't mean we don't have good teachers. We do have a good support system, and I take advantage of every opportunity that's given to me. The teachers that I've had since I've been here -- 99% of them, they saw something in me. They didn't give up on me. Even when I was going through my personal issues or whatever, they stuck by me. And they made sure I got myself together and didn't fall off track. With the college & career center, they help us a lot. Just because the building is run down doesn't mean the teachers or staff are run down. I know it's hard for them to come through the back door every day as well, but they put that aside. Some teachers deal with it -- they try to make education better for us, and they do everything they can. Some people might say, 'I can't work here,' but our teachers buy fans, seal windows, do the best they can to make learning comfortable for us and to encourage us. They might have their opinions about the building too, but they're there for us. This is the high school for the area. For many of the students here we have no place else to go. Because I come to school and I do what I have to do, I don't let the facilities get in my way of an education. Yeah, I spent 4 years here, but I don't have to spend the rest of my life here. Just because the facilities are bad doesn't mean a student doesn't have to make the best decisions for themselves. If you have the teachers that I've had, you can put that aside. Sometimes I just come to school to talk to my teachers or get advice on college. When I had to send off letters for college financial aid, I knew there are people at Roosevelt who have answers to my questions. I think if we had better facilities to coincide with the great staff members -- not only teachers but advisors and counselors also -- enrollment would shoot up. There's nothing wrong with the teachers and the students are still good, it's just the facilities and the building that need rejuvenation. If the physical state of the building could match the commitment of the students and staff, to go along with the greatness that's already happening inside, then Roosevelt could become a well-rounded educational environment.